Minimal order quantity for this item is 50. Zinc Plated to create a bright, rust-resistant finish. Featuring recessed wings for excellent finger grip. Unified Thread System: The Unified Thread System (or Unified Thread Standard - UTS) defines a standard thread form and series - along with allowances, tolerances, and designations - for screw and bolt threads commonly used in the United States and Canada. U.N.C. : Acronym, Unified National Coarse. The most common thread type of the Unified Thread System (U.N.C. - U.N.F. - U.N.S. - etc. ), and is the preferred thread type for general purpose inch fasteners. Because of the coarse pitch, the threads are deeper than finde threads (U.N.F.) and are easier to assemble without cross threading. U.N.F. : Acronym, Unified National Fine. A thread type of the Unified Thread System (U.N.C. - U.N.F. - U.N.S. - etc.) that has a slightly higher breaking load capacity than U.N.C. (Unified National Coarse) threads. This higher breaking load capacity is a result of the more shallow thread depth and larger tensile stress area for fasteners of the same identical material and diameter. The smaller lead angle allows for fine adjustments where needed. 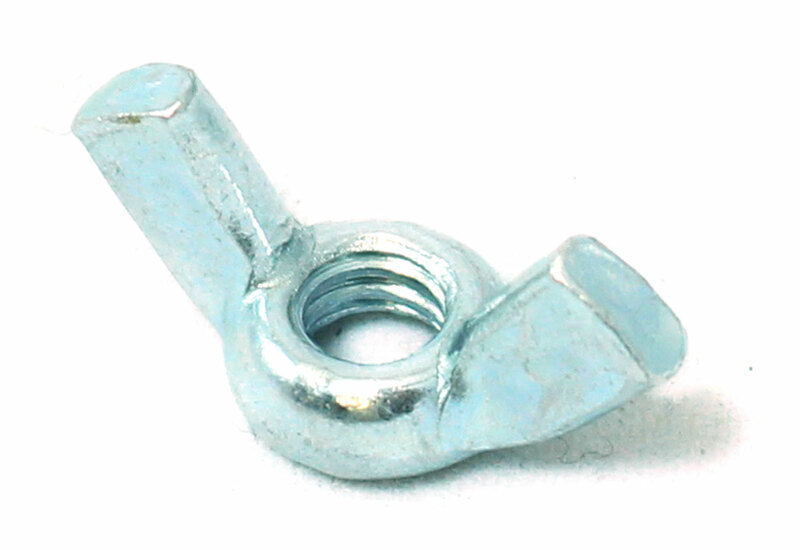 Wing Nut: The wing nut is built with a pair of projections to allow the nut to be finger tightened. It's ideal for applications that require frequent or occasional on-off hand pressure torque or release. Cold Heading: Cold heading (or forging) is the process of forming ferrous and non-ferrous materials without applying heat to assist in the formation process. 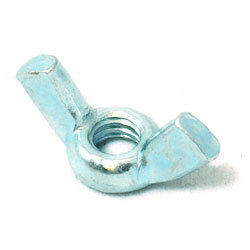 Steel Wing Nuts *Cold Forged - Bright Zinc Chromate Plated / Rust-Resistant Finish - Recessed wings for excellent finger grip.